FMC Technologies is a global market leader in subsea systems and a leading provider of technologies and services to the oil and gas industry. We help Exploration and Production (E&P) customers overcome difficult challenges with onshore and offshore drilling, completion and production technologies and services to improve their returns. The corporate values are embodied in the way they do business. They collaborate with their customers, within the organization as colleagues and within the communities in which they work. And the focus on health, safety and sustainability is critical to our success. FMC Technologies’ reciprocating pumps have provided exceptional performance and value since their introduction in 1884. 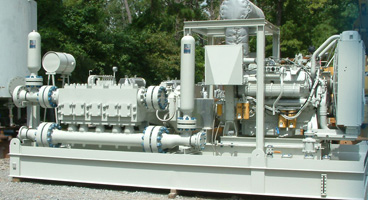 As a pioneer and global leader in providing high-pressure fluid pumping solutions within a variety of markets, FMC Technologies offers a broad array of high pressure piston and plunger reciprocation pumps within the industrial, oil and gas, core drilling and mining, sewer cleaning, horizontal and vertical drilling, reverse osmosis and agricultural markets. Piston and plunger pumps are characteristically high efficiency pumps with rated efficiencies of 85 percent to 90 percent and in some cases actual efficiency higher than rated. The high efficiency is due to the direct energy transfer directly to the fluid through the reciprocating action and positive displacement of the fluid. With single stage centrifugal pumps’ maximum efficiencies in the range of 60 percent to 70 percent at the optimal conditions, the reciprocating, positive displacement piston and plunger pumps becomes the choice for energy critical applications. The efficiency of multiple stage centrifugal pumps is reduced even more than single stage pumps. FMC Technologies offers a complete line of piston pumps (Bean pumps) in sizes ranging from 3 to 450 HP. FMC Technologies’ Bean piston pumps deliver outstanding value and performance for a variety of applications. The Bean piston pump design continues the FMC Technologies tradition of putting customers first and keeping them ahead with engineered solutions. 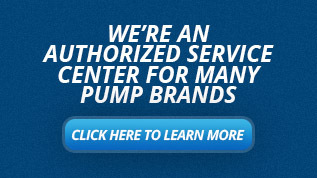 The Bean pump lowers the overall cost of pump ownership for our partners’ customers by developing a win-win strategy. The Bean pump is designed to do more (increase performance) with less (wearable items). Continuing on this theme to lower overall operating pump cost, FMC Technologies has increased the volumetric efficiency, material components and front access of their Bean pump fluid chambers. The “HVE” feature increases the pump’s priming characteristic without increasing the size (added cost) of a feed pump. FMC Technologies customized this 10,000 psi (690 bar) blowout preventer plunger pump skid for offshore oil and gas applications. FMC Technologies’ plunger pumps are chosen for the most demanding applications due to their high quality, ease of service, pump longevity and low cost of ownership. 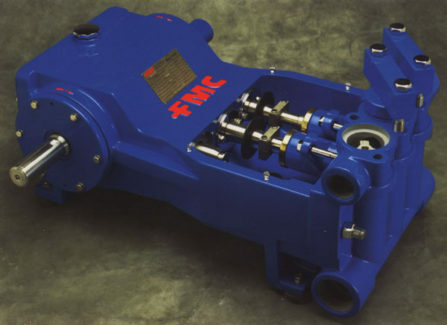 Extremely versatile, FMC Technologies’ plunger pumps can be readily adapted for optimum performance within a wide range of markets and service conditions. Depending on the application, the pump’s fluid ends can be equipped in ductile iron, carbon steel, aluminum bronze, duplex stainless steel, and other high end materials. All pumps have been carefully designed with oversized bearings and heavy-duty components to provide years of operational life.